"An Italian side dish special. Simple but full of flavor." Heat olive oil in a frying pan over medium heat; cook and stir pancetta and onion in the hot oil until pancetta is translucent, about 5 minutes. Stir peas, white wine, thyme, salt, and pepper into pancetta mixture; bring to boil. 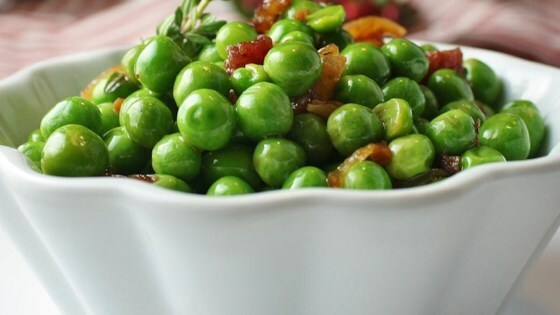 Reduce heat and simmer until peas are tender and liquid is slightly reduced, 3 to 5 minutes. We made this dish as a side to a nice Chicken Dish. The Peas were a hit, a real gourmet side dish for sure! Easy Peasy (Pun Intended) Thanks Don! Nice change from the your ordinary peas. The thyme really works well here, and I also added some garlic. In a pinch, I'm sure bacon would be a good sub for the pancetta. It was great! But the pancetta didnt really crisp up it was a bit chewy. I would try to fry it longer than what the recipe says next time. I made this recipe before it was published, it is wonderful, full of flavor, and a keeper in my home. YUM!! !